Deviantart user Slatd, the same creator of the Nokia N1 Android phone is now back with another concept. 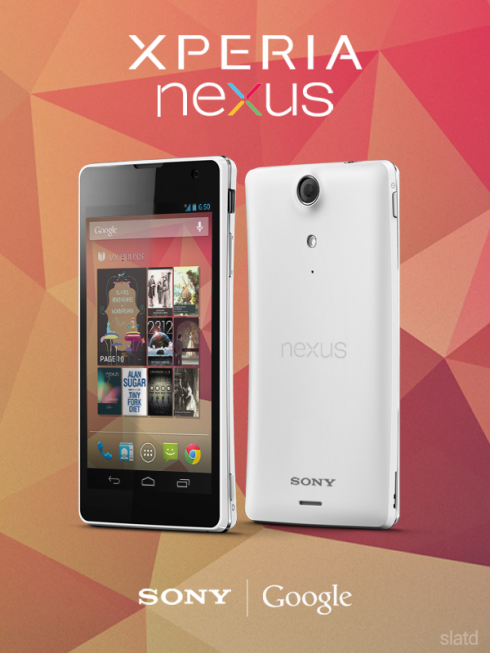 This time is a new generation Nexus phone, one made by Sony and Google. Meet the Xperia Nexus, a curved handset with a very slim design and a look inspired by the Xperia TX, as the designer himself claims. I’m guessing this model runs Android Key Lime Pie, has a great 12 megapixel camera, quad core Snapdragon S4 Pro CPU and 1.5 or 2 GB of RAM. A microSD card slot, NFC and LTE are probably on the specs list, together with what looks like a 4.5 inch 768p screen. Such a display choice is trendy nowadays, just look at Nokia’s latest Lumia phone. Seeing how the body of the Sony Google Nexus phone is curved a bit, I expect a fantastic waistline, maybe something lower than 7 mm, which would be a record breaker for a mainstream device.